Physical therapy students joined in the Global PT Day Service, observed on Oct. 14. Three events were planned for the annual event, said Michael Geelhoed, D.P.T., OCS, MTC associate professor and director of clinical education for the department of physical therapy. Students volunteered Oct. 13 at the students. 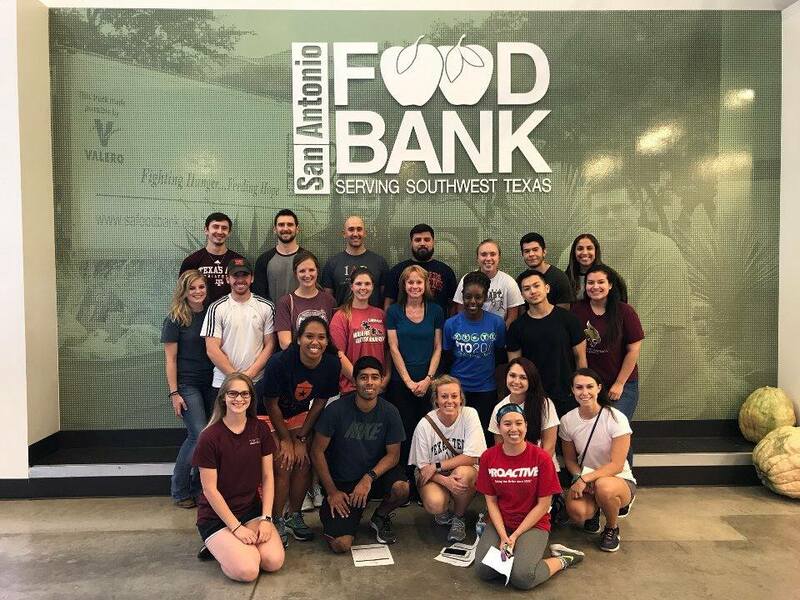 The following day, students packed food boxes at the San Antonio Food Bank and spread mulch at a dog park. "I think it fits in with what our program is doing already," Geelhoed said, nothing that students already are required to perform 20 hours of community service per semester. First-year physical student Kalie Pietsch helped organize the day's events. She said 22 students spent more than two hours working with volunteers from other organizations to pack 2,000 food boxes for seniors at the food bank. About 35 students spread mulch at a dog park at Phil Hardberger Park as part of a Work Out Help Out event, which integrates exercise into volunteers did squats, ran, jumped and performed partner activities. Taking time away from a busy schedule to give back was meaningful for Pietsch. "As a student, it's very important to participate in the city in which we are attending school," she said.